We stock our travertine in french patter, tiles and pavers in ALL of our travertine colours. Travertine prices from $44m2 thru to $89m2. We deal DIRECTLY with the Turkish quarry owners getting you value for money travertine. TRAVERTINE - What YOU need to know before buying travertine tiles or pavers? Travertine Tiles and pavers are an eco-friendly paver made of natural material that can be used in a variety of different ways when designing and constructing your outdoor landscape. Benefits to using travertine natural stone pavers include lack of discoloration, extreme durability, and the fact that travertine doesn’t heat up in hot weather. Traversing barefoot across natural stone driveway pavers made of travertine is a lot more pleasant to do than walking across brick, other stone materials, or asphalt due to its non-conductive manner. Travertine is a material that can be found across the globe and is formed by a geological layering process that builds over time. Using outdoor Travertine pavers will not only enhance the look of your yard or pool area but will also be comfortable to walk on at all times throughout the year. Travertine Prices – Prices vary from $49m2 through to $89m2 inc GST, mainly due to colour and to a lesser extent tile size. 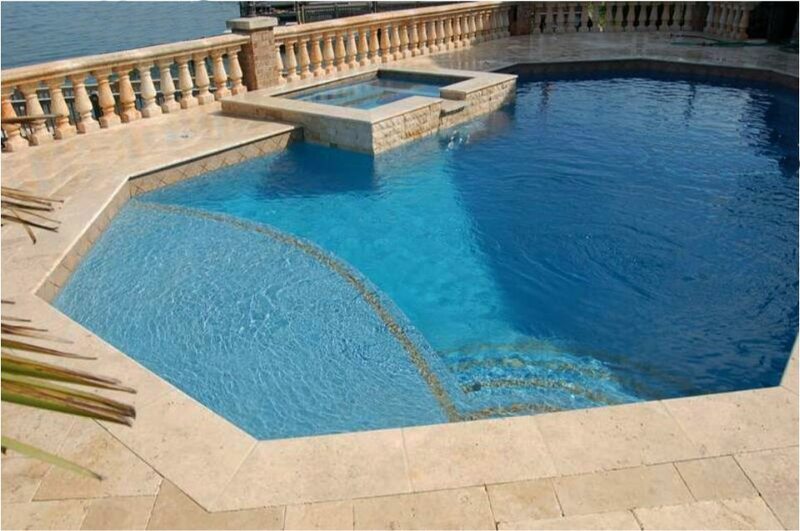 Travertine Sizes – Available in 12mm and 30mm thicknesses ss well as 40mm and 75mm drop face pool coping. A very popular form is in the French Pattern but it is also available in 610x406mm and 610mm x 610mm. An exceptionally popular stone used throughout Europe, it is great for use in just about any area ; Floor Tiles, Wall Tiles, Outdoor Tiles, Pool Tiles. DO NOT USE HONED & FILLED TRAVERTINE OUTSIDE AS THEY ARE TOO SLIPPERY, ONLY USE TUMBLED & UNFILLED WITH A BRUSHED SURFACE. Sydney… ASK US A QUESTION ABOUT OUR TRAVERTINE TILES & PAVERS? Are you intrigued with Travertine and its timeless natural beauty? Would you like to learn more? Here are 13 facts about Travertine Tile. 1. Travertine is a type of limestone that forms in hot mineral springs around the world. According to Wikipedia, limestone is a sedimentary rock made of calcium carbonate, a primary component of shells. In North America, the most notable Travertine formation is Yellowstone National Park. 2. The name ‘travertine’ was derived from the name of the ancient Italian city Tibur, now Tivoli, with roots beyond Roman times. Travertine was known as lapis tiburtinus, i.e., tibur stone, which over time became travertine. 4. Travertine is mined from quarries all over the world using many methods including Channeling machines, Wire Saws, Chain Saws and Water-Jet Cutting machines. From the quarry, it is either stored in a warehouse or taken to a mill or production facility where it is cut into slabs and sent through different process depending on the type of finish desired. 5. When you look at it, you’ll notice what makes Travertine unique: naturally occurring holes and troughs on the surface. Travertine is also porous. Both of these characteristics result from how the stone forms over time. 6. The holes and troughs that you find in Travertine can be filled with grout, or left unfilled. In many cases Travertine tile is filled at the factory during production. The size of the holes indicates whether or not the stone is a premium, commercial or select cut. As a rule of thumb, the smaller the hole, the more premium the cut of Travertine. 7. Travertine is often used as a building material and can be seen in architecture across Europe dating back to the Roman Empire (Burghausen Castle in Germany) . The Roman Coliseum and bath houses in Rome and the Lobby of the Sears Tower and first floor walls at the UCLA medical center were all built with Travertine.). Travertine has been used in everything from aqua-ducts to load bearing pillars. It is most commonly used today for floors, walls, and backsplashes. 8. Travertine comes in a variety of colors including white, tan, brown, cream and gold. It can also be found in varying shades of red, pink and orange. Some Travertine has black veins running through it. 9. Travertine is produced in a variety of styles including, honed, tumbled, polished, brushed, saw cut and chiseled edge. 10. Modern Travertine tile encompasses a range of sizes. The most common tile sizes are 4×4, 6×6, 12×12, and 18×18 and tile trim pieces. 11. Travertine can be used inside or outside, by itself or as a decorative piece mixed with granite, marble, ceramic or porcelain tile. 12. Travertine Tile is softer than granite. It needs to be sealed to protect its natural beauty and your investment. Sealing Travertine is very easy and should be done during installation and periodically thereafter – usually every three to five years. You’ll find a number of sealer options available today. The most common are Enhancing and Natural sealers. Enhancing sealers darken stone and give it a ‘wet’ look whereas natural sealers offer the same protection without changing the stone’s appearance. 13. When installing Travertine, be sure to blend the tiles first. Also, use a white thin set particularly with lighter travertine. Gray thin set may darken or tint your stone. Thin set should be mixed to a sticky peanut butter consistency. You will want to use a notched trowel. Some installers recommend sealing travertine before and after installation other recommended it before and after grouting. SALE NOW ON up to 50% off Recommended Retail prices for TRAVERTINE TILES and TRAVERTINE PAVERS price from $49m2 inc GST !